There are times in every Expat Aid Worker’s life when they need a well-earned break from integrating gender sensitivity into a painstakingly crafted stakeholder analysis. Despite being out of touch with pop culture, there are moments in the EAW’s life when nothing will do but to unwind with a lousy copy of a lousy movie. As with everything else in the EAW’s life, there is a set of unwritten and un-discussed rules that govern the purchase and viewing of movies. The subject matter of the movie doesn’t matter. Given that it’s difficult to locally source the EAW’s preferred cinematic diversions, which are films in which college educated, upper middle class Westerners discuss their feelings at length, EAWs are limited to the selection of American movies that the locals like to watch. No matter where in the world your typical EAW is mainstreaming a value chain approach, local tastes in American entertainment generally run to movies in which explosions, punching and humorous falling down predominate. Although they will never admit it to you, most EAWs don’t have a problem with the limited selection of lousy movies available for viewing in The Field. Your typical American EAW believes him or herself to be so starved for conversation in English that they will happily watch The Matrix Revolutions or Transformers: Revenge of the Fallen. There are even documented instances of heterosexual male EAWs sitting through Miss Congeniality II, although experienced EAW watchers believe that the desire to get into the pants of female EAWs may have been a factor in those cases. What matters in the purchase of lousy copies of lousy movies is the provenance of the copy and the person the EAW buys it from. It goes without saying that the movies that EAWs purchase are pirated. In fact, signifiers of obvious, amateurish intellectual property theft are highly valued by EAWs. Packaging should feature grainy scanned images of the movie poster, perhaps supplemented with pictures of the movie’s stars cut out from a magazine. Advertising copy written in English on the back of the VHS tape or DVD case should be rife with grammatical errors. Bonus EAW credibility is offered if the advertising copy is a weird little mini-manifesto about the movie written by a local in which the entertainment in question is both praised and condemned. The recording of the movie should be a “screen copy”, that is to say, a movie illegally filmed with a consumer-grade video camera in an American movie theatre. EAWs enjoy pointing out the part in the movie where the man three rows up from where the camera is positioned gets up to use the restroom, or the part where the harried mother loses her temper with her fidgety kids. Of equal importance is the environment the movie is purchased in and the person it is purchased from. EAWs are excited by purchases of lousy movies that resemble how they imagine purchases of illegal narcotics to be. It is unacceptable to buy a movie from the host country’s one supermarket that serves expatriates and the local elites. It is somewhat better to buy them out of a wooden crate from the stall at the bazaar next to the one that sells whole pig heads, but it is best to have a “movie guy” who sells movies from the back of his car and changes the subject every time the EAW asks why he limps. “Movie guys” should have either discriminating taste in movies or the good sense to agree with everything the EAW says concerning the entertainments on offer. Having one’s own “movie guy” is a good way to demonstrate one’s integration in the local community and thus one’s superiority to other EAWs. Particularly for those working in Africa, lousy movies are crucial for the EAWs desperate to be “one of the guys” with their local staff but don’t understand anything about football or Jesus Christ. Clearly, the only acceptable conversations to have with local colleagues must include either a) a deity, b) Arsene Wenger or c) any cast member of The Expendables. My DVD guy has Monday’s off. 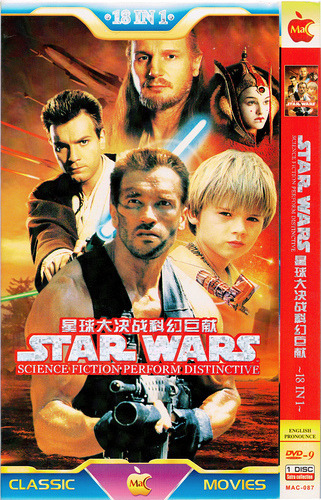 Hey, I didn’t know Arnold Schwarzenegger was in Star Wars (aka Science Fiction Perform Distinctive)!